Supermicro’s NVMe SSD Systems with Intel Optane™ SSDs for the Data Center enable breakthrough performance compared to traditional NAND based SSDs. The Intel Optane™ SSDs for the data center are the first breakthrough that begins to blur the line between memory and storage, enabling customer to do more per server, or extend memory working sets to enable new usages and discoveries. The PCI-E compliant expansion card delivers an industry leading combination of 2 times better latency performance, up to more than 3 times higher endurance, and up to 3 times higher write throughput than NVMe NAND SSDs1. 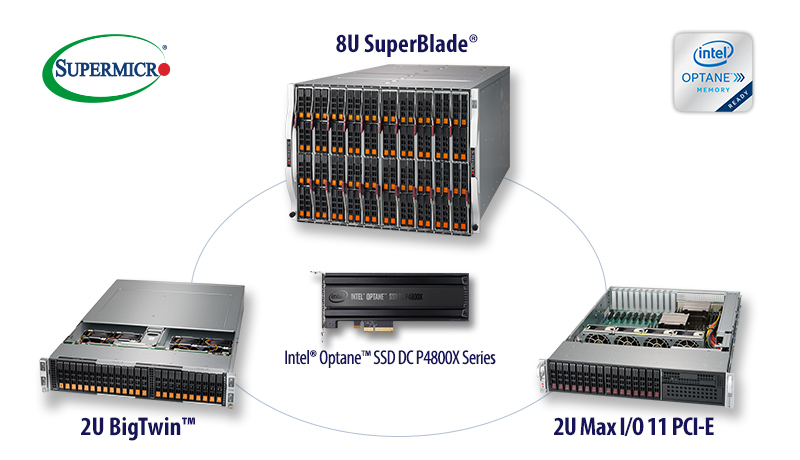 Optane is supported across Supermicro’s complete product line including: BigTwinTM, SuperBlade®, Simply Double Storage and Ultra servers supporting the current and next generation Intel® Xeon® Processors. These innovative solutions enable a new high performance storage tier that combines the attributes of memory and storage ideal for Financial Services, Cloud, HPC, Storage and overall Enterprise applications. The first generation Supermicro supported Intel Optane™ SSDs are initially a PCI-E compliant expansion card with additional form factors to follow. A 2U Supermicro Ultra system will be able to deliver 6 million WRITE IOPs and 16.5 TB of high performance Optane storage. Intel Optane™ will deliver optimal performance in the 1U 10 NVMe All-Flash SuperServer and the capacity optimized 2U 48 All-Flash NVMe Simply Double Storage Server and provide accelerated caching across the complete line of NVMe supported scale out storage servers including the new 4U 45 Drive system with NVMe Cache drives.